Spacious room w king bed, 3 piece en-suite bath, tv/, wi-fi, seating and snack area, bar fridge. Use of summer kitchen with cooktop, fridge, dishwasher, w/d unit and eating areas. Comfortable room w queen bed, 3 piece en-suite bath, tv, wi-fi, seating and snack area, bar fridge. Use of summer kitchen with cooktop, fridge, dishwasher, w/d unit and eating areas, BBQ. Lovely view of back garden and pool. With access to the fully equipped summer kitchen, you can start your day with a delightf breakfast overlooking the lovely garden. Both suites have access to the patio, BBQ, swimming pool and gazebo where you can relax after touring The County. 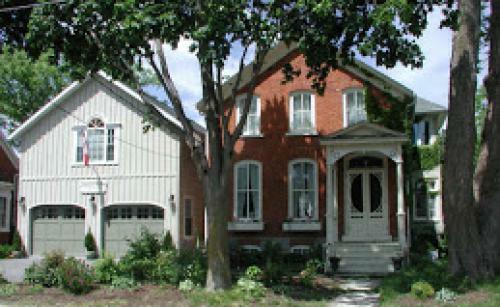 Traditions, the perfect place to unwind and relax while enjoying the beauty and charm of Prince Edward County. A perfect place for cyclists, girls getaways and wine lovers. A romantic peaceful get-away in the "centre" of town.